Hey guys! It's my 29th birthday today! It's scary to me that, although I'm turning 29, I still feel as nomadic and unsettled as I did when I was 21. After all, my move to New York will be my 9th move (and 4th state, and 10th apartment/house) within the last 5 years. I'd like to think that I've made some sort of progress in these last few years, but sometimes, I'm not quite sure if I actually have. This past year wasn't easy and taught me that I've still got a lot to learn — especially when it comes to my priorities and figuring out what's important. But as a June baby, I'm lucky that I get to have a birthday in the middle of the year. Especially since I treat my birthdays the way most people treat New Year's Day — a chance to look at what went wrong over the last year, make resolutions, and reset. This year, that means basically starting over from the quiet, career-focused life I regressed to since moving to San Francisco. I don't have anything too specific in mind, but I do know that a) I want to leave this city ASAP (and that's happening so soon, so yay!) and b) I want this year to be less stressful and funner than the last. 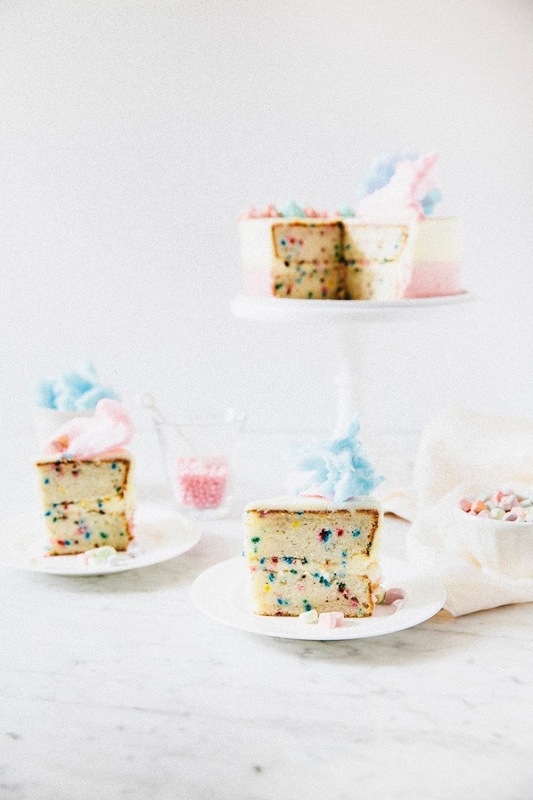 And what better way to kick off that goal than with a lighthearted and whimsical cake? For this cake, I channeled my inner Coco Cake Land and whipped up this funfetti cake with strawberry cream cheese frosting. 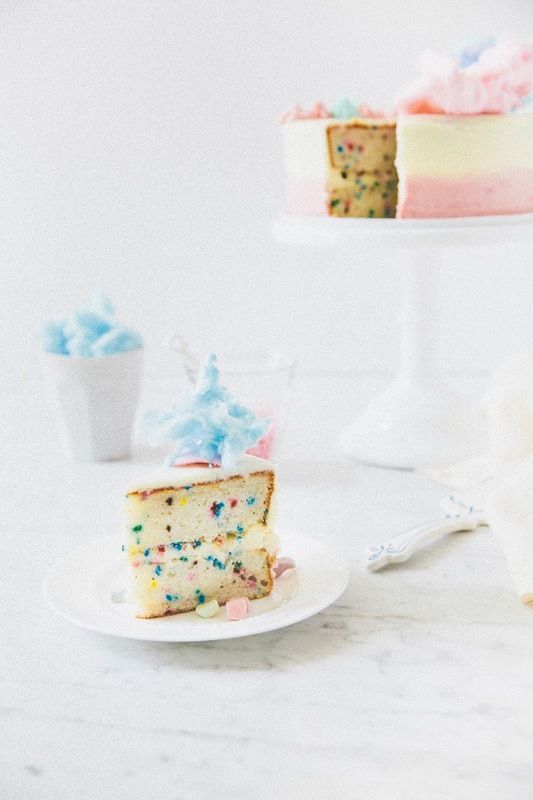 The funfetti cake recipe is actually one of Molly's and has been on my blog before — I made it almost two years ago for my third blogiversary and it was just SO DAMN GOOD that I've just been waiting for an opportunity to make it again. And this time around, I swapped the vanilla flavor used in the original recipe for "Princess Bakery" extract. Princess Bakery is a legit flavor that comes in a bottle and tastes of vanilla, citrus, and almond. It's lovely and the flavor that all your homemade bakery style baked goods have been missing. 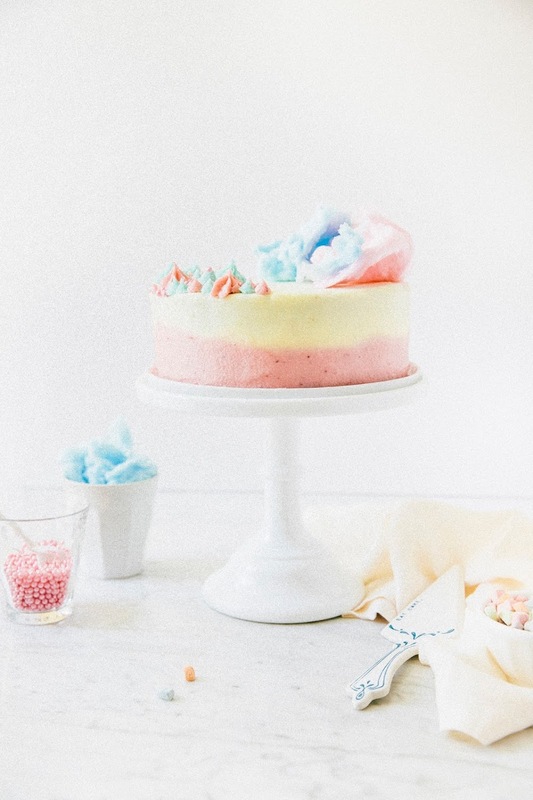 I used Tessa's ombre frosting technique to create a "dip-dye" effect on my cake, with half the cream cheese frosting flavored with a fresh strawberry puree. 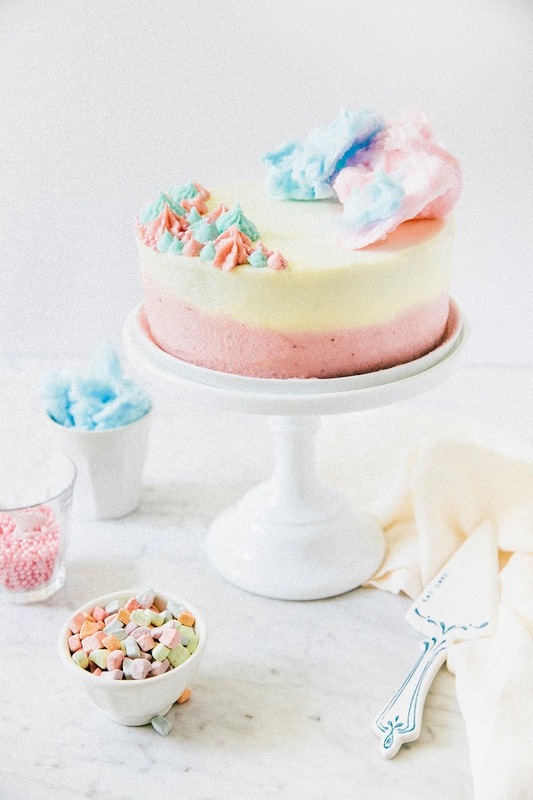 I then topped it all off with cotton candy because it's my party and I can do what I want. So 29 — here I come! This recipe uses a couple of weird ingredients: Princess Bakery emulsion and ground vanilla bean powder. Both are available on Amazon and are worth sourcing — it's what makes this cake special! 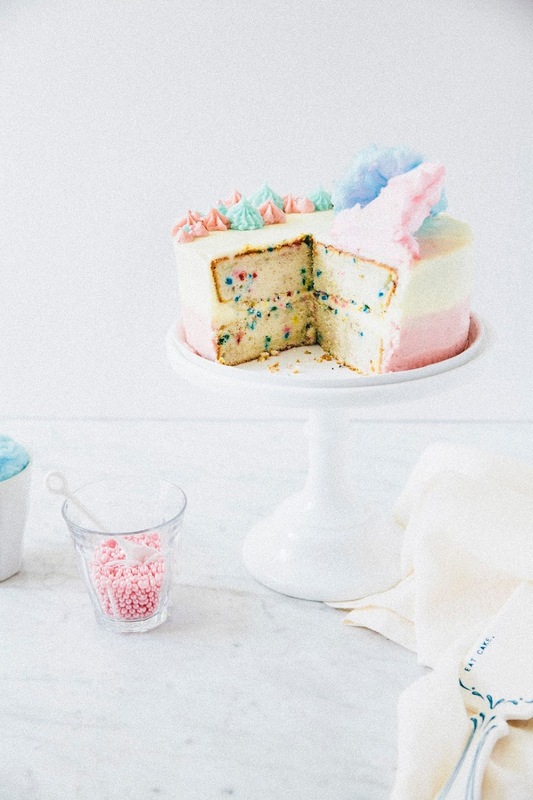 However, if you just want to make a cake with ingredients you'll likely already have on hand, feel free to use Molly's original recipe with either 2 tablespoons clear vanilla extract or my version with 1 tablespoon pure vanilla extract. To get the dip-dyed look, I took my batch of cream cheese frosting and stirred in a few teaspoons of strawberry puree to flavor half the batch and dye it pink. I then used Tessa's ombre frosting technique to create the "dip-dye" effect with the regular cream cheese frosting and strawberry tinted batch. 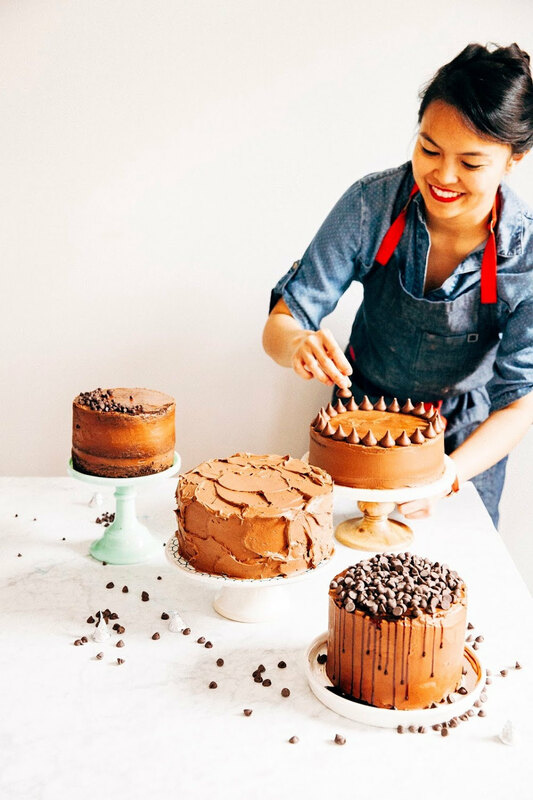 I really recommend using her tutorial (and checking out her cookbook!) as it's got some of the best step-by-step photos I've ever seen! 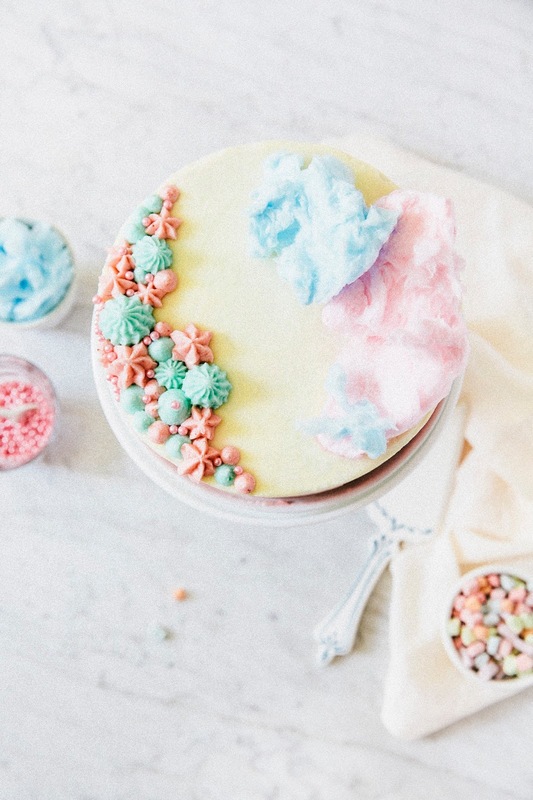 If topping the cake with cotton candy, be sure to serve the cake immediately — cotton candy hardens and shrinks almost immediately when it touches something moist (like frosting). I got my cotton candy from World Market, but you can also buy cotton candy from Amazon. 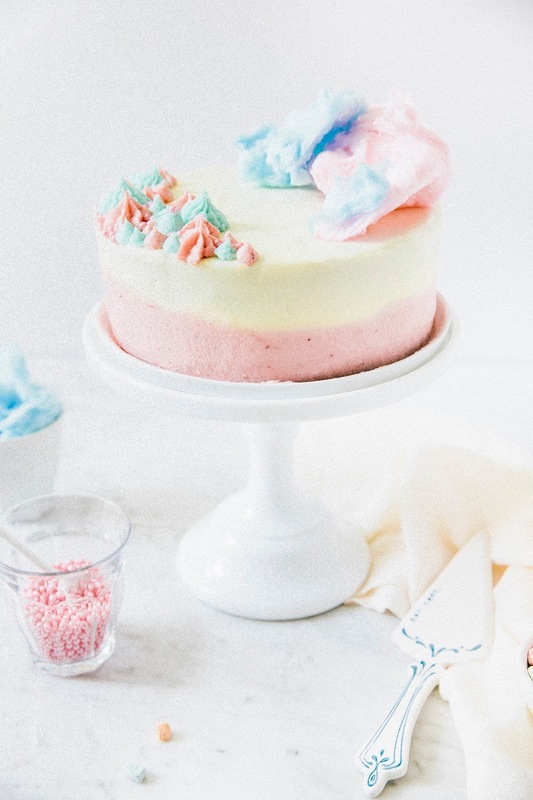 Or, if you want to splurge and get the stuff fresh, you can use a countertop cotton candy maker (which, not gonna lie, this is currently on my Amazon wishlist)! Center a rack in the oven and preheat to 350 (F). Prepare two 8-inch cake pans by spraying liberally with cooking spray and lining the bottom of each pan with parchment paper circles. Lightly spray the parchment paper and set aside. In a medium bowl, whisk together 2 1/2 cups cake flour, 2 1/4 teaspoons baking powder, 1 teaspoon vanilla bean powder, and 3/4 teaspoon kosher salt. Set aside. In the bowl of a freestanding electric mixer fitted with a paddle attachment, combine 1 cup unsalted butter and 1 1/2 cups granulated sugar and cream on medium-high speed for at least 5 minutes, until light, fluffy and doubled in volume. Lower the mixer speed to its slowest setting and add 4 large egg whites, one at a time, only adding the next one until the previous egg white has been fully incorporated. In a small liquid measuring cup, whisk together 1/4 cup plus 2 tablespoons vegetable oil and 2 teaspoons Princess Bakery emulsion and slowly stream into the egg mixture until fully incorporated. With the mixer running on low, add the flour mixture (from the 2nd step) to the butter mixture in three additions, alternating with adding 1 cup whole milk in two additions, starting and ending with the flour mixture. Mix on low speed until just incorporated — be careful not to overmix! It's okay to have one or two flour streaks left at this point. When the dry ingredients have just about disappeared, stop the mixer. 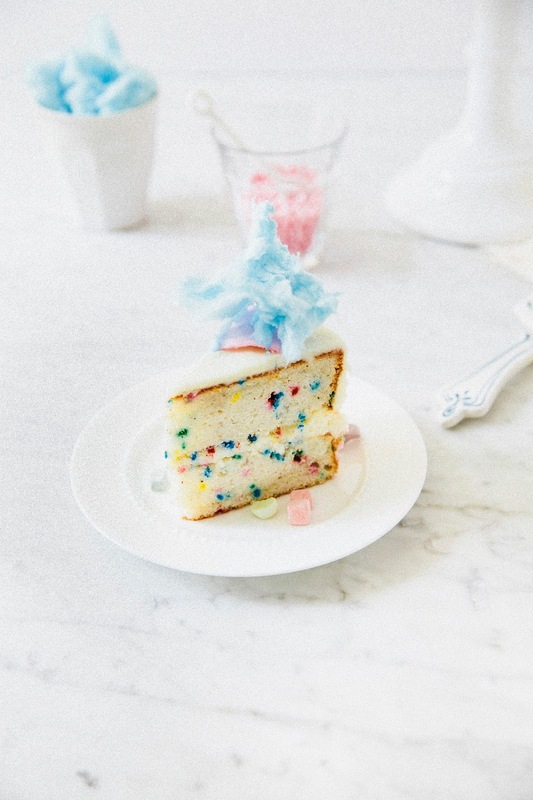 Use a rubber spatula to fold in 2/3 cup of sprinkles into the batter. Be careful not to overmix! Again, just fold until the sprinkles are evenly incorporated throughout the batter. Divide the batter evenly between the prepared pans. 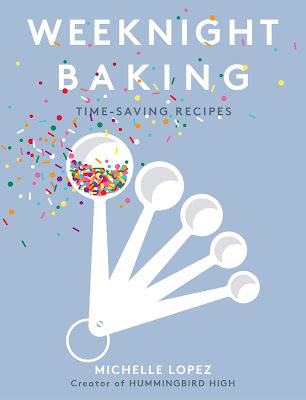 Transfer the pans to the preheated oven and bake the cakes for 35 to 40 minutes, until a toothpick inserted into the center of the cake comes out clean and the tops of each cake bounce when gently poked with a finger. In a medium, heavy-bottomed pot, combine 8 ounces strawberries, 1 tablespoon lemon juice, and 1 tablespoon water. Cook over medium heat until the strawberries start to soften, around 4 to 5 minutes, stirring the mixture occasionally to prevent the fruit from sticking to the bottom of the pot. Once the strawberries have softened, use a potato masher or wooden spoon to mash the strawberries to a pulp — if you have an immersion blender, this would be a great use for it too! Continue cooking the strawberry mixture until it thickens and reduces significantly, another 10 to 15 minutes. Transfer to a jar or bowl and set aside on a wire rack to cool to room temperature. The puree will keep covered in the refrigerator for 1 week. In the bowl of a freestanding electric stand mixer fitted with a paddle attachment, beat 8 ounces cream cheese on medium speed until soft. Add 2 cups unsalted butter, 1 teaspoon Princess Bakery emulsion, and a pinch of kosher salt and beat until light and fluffy, using a rubber spatula to scrape the bowl as necessary, about 3 minutes. With the mixer speed still on low, gradually beat in 5 cups confectioner's sugar, using a rubber spatula to scrape the bowl as necessary, until well blended. When all the sugar has been added, increase the mixer speed to high and beat until the buttercream is fluffy, about 1 minute. Use a rubber spatula to scrape out half the mixture into another bowl. Return the mixer bowl back to the mixer stand and add 2 teaspoons of the strawberry puree (from the 2nd step). Beat on medium-high speed for 2 to 3 minutes, until the mixture is pale pink and the strawberries have incorporated into the cream cheese frosting. If the mixture looks a little too wet, add confectioner's sugar 1 tablespoon at a time until the mixture comes together again. Use immediately. Check out my birthday cake in 2012, 2013, 2014, and 2015!